For most of us, moving represents so much more than a mere change in address. Moving often accompanies a change in one’s life—from graduation, marriage, a new job or professional opportunity to divorce or personal loss. And if you are moving with your family, there may be many details to take care of—from finding new schools and pediatricians to helping your children adjust to a new community and new friends. All of this tends to add stress (often positive stress) to the moving process. It’s therefore important to make sure that your moving process goes as smoothly as stress-free as possible so that your energy can go into creating your new home and adjusting to your community. Here is a list of the best tips for moving that will save you hours of work and days of unnecessary stress, and allow you and your family to enjoy your new home as quickly as possible. 1) Carefully Select a Moving Company you can Trust. More than anything else, the quality of your move will be determined by the integrity and efficiency of your moving company. All the above factors are critical to your having a great move. When making your final decision on a moving company, do not necessarily base your decision on which mover gave the least expensive quote. Check out references and reviews, call the better business bureau, and speak to friends and family who have recently moved. Once the mover you have selected gives you a contract, read through the entire contract carefully and make sure there are no additional fees, and that everything you were promised by the moving company’s salesman is in writing. 2) Plan ahead before embarking upon packing. You need a packing strategy. The more you plan your packing on paper and the more time you give yourself to complete the process, the less likely you are to feel overwhelmed and go into what I call packaging panic mode! Here are some steps to take, questions to ask, and factors to consider during the packaging planning process. A) Decide whether you will be packing yourself, or whether you will want to hire your movers to pack for you. Your answer will most likely be based upon a combination of money and time. Getting your house professionally packed will add to your moving expenses and may or may not be financially feasible, However, keep in mind yourself before deciding to pack yourself that professional movers are typically able to pack up your entire home in one day—saving you days or weeks of packing. If you are going to need to take off from work, professional packing could be a wise financial decision. B) If you are packing yourself, as many people do, you need to ask a representative from your moving company (this will often be the salesman) for guidance on how many moving cartons he or she thinks your move will require. Most likely, you will need to purchase a combination of general and specialty moving boxes including book cartons (used not only for books but also for heavy or fragile items), medium and large cartons, dish packs, wardrobes, and mirror cartons. Additional moving box options include TV boxes, wine boxes, bicycle boxes, sofa boxes and mattress boxes. You will also need to purchase markers for marking up each box to indicate its contents, carton tape, wrapping paper, and bubble wrap. Movers will bring moving blankets, so that is generally not necessary. 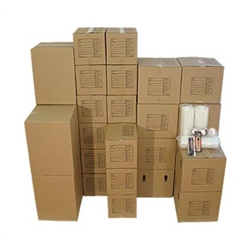 Before purchasing your moving boxes, acquaint yourself with what to look for in a moving box and be sure to purchase high-quality cartons Do not look to buy the cheapest moving boxes or materials, as thin, inexpensive moving boxes can tear and crush during the moving and stacking process. You want to make sure that your moving boxes are rated at least a 32 on ECT crush test. You will also need to purchase wrapping paper (sometimes referred to as newsprint), carton tape, and possibly bubble wrap. C) Decide whether you want to go through years of accumulated dishware, papers, memorabilia, old toys, old clothes, etc. before your move or after your move. Ideally, you should give yourself two weeks to go through your possessions so that you can make a pile for discarding, donating, giving to other family members, and keeping. The goal is always to streamline your possessions in your new home so that you have a fresh, uncluttered start. Many home consultants talk about the idea of filling your home with only items that give you a feeling of joy or are desired or of use at present. The thinking here is that you should not let yourself be overwhelmed by items that you are keeping, merely because of a sense of guilt over throwing them away. Moving gives you the opportunity to reevaluate what you want to keep in your home. If you don’t have time to go through your possessions before the move, then put all items that you plan on organizing into piles into designated boxes or crates. Do not open them to unpack until you have the time and energy post-move to go through them. D) If you do not have experience in packing, it’s important to educate yourself before packing so that your possessions are protected. I suggest watching videos on wrapping and packing such –How to Pack Dishes Safely. For example, heavy items and dishwater should always go in either a dish pack or book carton, and never in a large box. E) Create a packing timeline that gives yourself plenty of time so that you are not overly stressed or forced to stay up all night packing the night before the move. Pack your items in a way that gives you greatest access to what you will need just prior to the move. For example, it often makes sense to pack books, spare linens, spare toys and stuffed animals, and clothing you don’t imminently need first. The kitchen is often the last room to be packed, although you can pack your china early on. F) Make sure that every box is marked correctly, indicating the room the box is to be delivered to. 3) Strategically Plan for the Set-up of your New Home. The goal is to have as many people who need to be at your home for set-up come on the same days. This will save you valuable time if you need to be at work and can’t take off more than a few days of work for the move. So make your calls early, so that you can have multiple people on the same day. A) Cable television, telephone, and Internet You may want to have your cable and Internet service provider come the day of or day after the move (or even prior to the move if that is possible). B) Television Installation. If you are planning on hanging your television on the wall and running the wiring into the walls, your movers may not be able to do this for you. Some movers will contract with a 3td party to come the day of the move to help with this. Or, you may need to find someone on your own. In addition, you may need a media expert to come to help you with the set-up of your media and remote controls. D) If you are moving into a house rather than an apartment, you may need someone to come and evaluate the quality of your air-conditioning, water heater, sump pump, etc. E) Alarm System. If you are installing an alarm, you will need a visit from your security company. Remember to change your address on your driver’s license, and with all your insurance companies, credit card companies, banks, magazines, and notify all people from whom you receive important bills. Be careful that you do not miss out on receiving bills, which can lead to late payments and problems with your credit score as a result. Boxes, boxes everywhere! Have a plan in mind for how you will deal with all the boxes after the unpacking process. Your options are to flatten all your boxes and have them picked up by your local waste management company. Or, speak to your moving company or a local junk hauler about having your boxes taken away. If you have young children, it’s important to make sure they are carried for during the week of the move when your attention is very diverted. Of course, the best thing is to have family and good friends help out with your children. But if that is not possible, you might need to procure baby sitters to be with you at home. Have lots of food and drink on hand for your children, as well as toys and books they find comforting and fun. Moving can be more stressful for children than parents often realize. So make sure ahead of time that your children’s needs will be taken care of. Older children should also be guided into preparing for the moving period have them set aside all necessary school books, clothing that will take them through several days, things to do to occupy themselves on moving day, and all their small electronics that they will want access to. Gather all of the clothing, paperwork, and food you will want to have with you the day and even the week of the move and keep them safe. The bathtub is a great place to keep boxes or crates of items you plan to take with you in the car. Let your movers know not to take those particular boxes. Mark them clearly. All the mentioned tips will help you to get organized as well as keep family memorabilia safe during a move.